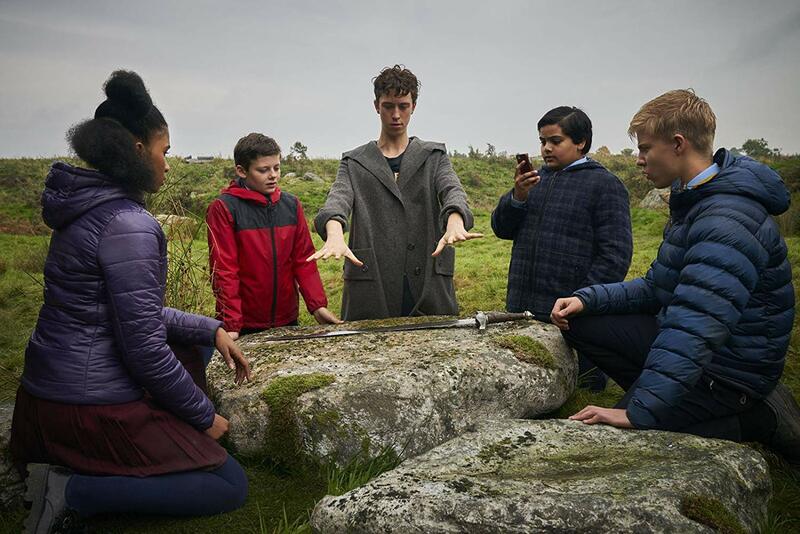 The Kid Who Would be King takes the Arthurian legend, drops it into modern day Britain, and puts a Stranger Things twist on it in the hopes of capturing some of the magic of those live-action adventure flicks for kids that were more prominent in the early to mid-nineties. 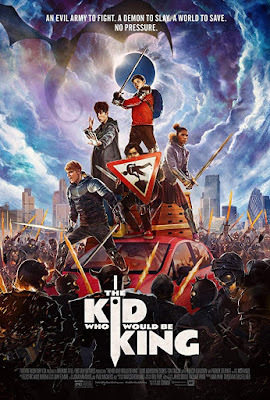 The Kid Who Would Be King is immediately appealing and don't get me wrong, has its charms, but as one sits and experiences the film it can't help but become evident that this charm largely is due to the fact audiences simply don't see this type of movie as often anymore. Were we still to get a handful of these kinds of movies every year odds are The Kid Who Would Be King would fall somewhere in the bottom half of the barrel, but given the rarity of its genre and style of its execution it can't help but to feel a little more special. Writer/director Joe Cornish, who is largely known for directing 2011's Attack the Black and introducing the world to a nineteen-year-old John Boyega, but who is also a frequent collaborator of Edgar Wright's and who has worked on screenplays for the filmmaker including Ant-Man and Hot Fuzz, has decided to place his own twist on this traditional hero's journey of a story that we've seen numerous versions and interpretations of since the beginning of cinema. Unfortunately, Cornish's twist on the material isn't exactly fresh or unique in any form that inspires something of a revitalized hope in this live-action children's genre which is rather disappointing given the way in which his previous film took certain tropes of the alien invasion film and spiced them up with a unique location and wicked sense of humor; it was fun because it featured conventional story beats upended by unconventional protagonists whereas The Kid Who Would Be King, which essentially has all of the same elements minus the R-rating, displays half the energy and even less of the creativity that seemed to surge through Attack the Block's veins. Cornish displays fits and starts of both as there is a certain energy to moments and flashes of innate creativity in others, but overall the film feels patched together and somewhat choppy-as if Cornish is never able to fall naturally into the groove he wants this story to find and thus the final product defaulting to this collection of overused themes and narrative devices that feels flat and rather bland. Cornish ultimately doesn't even attempt much of a twist on these beats, but more plays to the strength of them which-thankfully-is more than enough to keep the target audience entertained if not completely entranced. From left: Kaye (Rhianna Dorris), Alex (Louis Ashbourne Serkis), Merlin (Angus Imrie), Bedders (Dean Chaumoo), and Lance (Tom Taylor) begin their training in The Kid Who Would Be King. © TM & 2018 Twentieth Century Fox Film Corporation. Photo by Ashley Jackson. Beginning with an animated epilogue that catches up seasoned viewers and informs the younger ones on the high points of that aforementioned Arthurian legend, The Kid Who Would Be King swiftly delivers all of the story points the rest of the movie will then have to follow-up on which are largely the details about what kind of person will be able to pull the sword from the stone when it again returns to the mortal realm and the reasons for said sword doing so which mostly has to do with Rebecca Ferguson's villain, Morgana. Morgana is the half-sister of King Arthur and is bound (literally-to a tree) and determined to get back to the surface world to reign supreme or something like that as Arthur banished her until the world became truly divided and guess what...? She's about to come back, y'all. After this brief history lesson, but what is arguably the most visually enticing sequence in the film, we are introduced to Alex Elliot (Louis Ashbourne Serkis, son of Andy) and are presented with the context that his home life is rather broken; he has no father figure and while his mother (Denise Gough) is supportive, she struggles to connect with him. Alex has also just transferred to a new prep school where he's in the youngest class on campus and is thus bullied by older students, specifically Lance (The Dark Tower's Tom Taylor) and Kaye (Rhianna Dorris), though Alex does have one best friend in Bedders (Dean Chaumoo) who is unflinchingly loyal and the two would do anything for one another-Bedders even believing his friend when Alex comes to discover he might be a distant descendant of King Arthur. This all comes about after Lance and Kaye chase Alex down after school where he stumbles upon a construction site with a sword mysteriously placed in a stone. Alex is able to remove the sword quite effortlessly and while Alex doesn't necessarily buy into believing in the possibility of his lineage he begins to become more convinced as things get increasingly weird in his world. The first sign of such happenings is the appearance of a new kid at school who calls himself Merten (Angus Imrie), but in all actuality is the young version of legendary wizard, Merlin. Merlin-played in hid elder form by Patrick Stewart-informs Alex and Bedders that Morgana is an impending threat while convincing Alex of his validity as this chosen one, as this actual hero who must go on this journey of making allies out of his enemies and mending the division that separates the world so as to rally together to defeat Morgana and her army of undead soldiers. From here, it's not hard to see where the movie is going or what it's doing-even in terms of the lessons it is teaching-though they are more than suitable for the intended audience; the question is whether or not that target audience will become invested in this well-constructed, but rather routine execution of this familiar collection of story beats. The tediousness of what the majority of The Kid Who Would Be King offers might lead one to believe this is a disappointment considering the creative forces behind it, but it's not so much disappointing as it is content; it's more that the film delivers a sense of complacency whereas when you have a writer/director like Cornish you expect him to be anything but complacent when he seemingly has full creative reign over the project. That isn't to say the movie is totally devoid of any charms as the lively cast of characters ironically enough lend the film itself a fair amount of character. And while both Ferguson and Stewart's roles in the film-both of which have been promoted fairly heavily due to their levels of celebrity-are little more than glorified cameos it is to the credit of the young cast that most of the time we don't miss these more recognizable, more seasoned presence's on screen. Imrie is the true highlight here though, as his interpretation of the centuries old wizard via the body of a teenage boy plopped into modern times is something that's impossible to stop watching and in fact, something worthy of wishing the movie would stay with this character more often so as to see what it might be like exploring the contemporary world with the character. It would be enough to say Imrie is so good one forgets his counterpart in the role is Sir Patrick Stewart, but Stewart seems to realize what he can offer and what Imrie has to offer aren't exactly two sides of the same coin, but more the same man separated by those aforementioned centuries and the embodiment of different perspectives and understandings. The core group of kids suffice well enough though Serkis' performance does leave one wondering if he'd have scored the lead in this $60 million children's fantasy were it not for the wee bit of nepotism taking place. That said, Chaumoo's comedic timing is fairly solid even if the dialogue and/or jokes he has to offer aren't the best while Taylor and Dorris more or less imitate the countless move bullies that have come before them more than they do progress the stock characters in any form or fashion. The evil Morgana (Rebecca Ferguson) has risen from the underworld to conquer and rule our presently divided society. Having its heart in the right place counts for a lot in The Kid Who Would Be King though, and it is largely through these familiar, but time-tested themes and illustrated lessons that it's easy to appreciate the overall goal of the picture. While the genre of live-action movies for kids between the ages of eight and thirteen has largely been reduced to higher-brow computer animated films or that of the onslaught of comic book films and IP-related re-makes and/or re-boots there is something to be said for an original, modestly-budgeted live-action adventure epic for tweens that wholeheartedly embraces the genre and the idea of reiterating the importance of chivalry and encouraging communion rather than division. Cornish completely conveys they tone he is chasing through Serkis' similar wardrobe and overall look to Michael J. Fox in Back to the Future along with Stewart's Christopher Lloyd-esque wackiness even if he doesn't particularly nail it. There are far worse things that could be delivered to the world at our present time in history and while there might be little that will stick with adults as they leave the theater one would be remiss to say that younger viewers won't come to care about what occurs on screen. Furthermore, the acknowledgement of such real-life issues as the bullying and the broken family dynamic only further serve as proof that while Cornish may have been less creative in his broad strokes he's certainly in tune with a pulse that will tap into the smaller moments of reality for a generation while those bigger strokes contradict the stark reality with an escapism that still feels tangible. Electric Wave Bureau's synth-heavy and early video game-inspired score add the energy that is largely lacking from Cornish's screenplay while the film overall is strikingly good at piecing together the build-up to big sequences if not necessarily delivering on those sequences once the time comes. The prime example of this is in the final battle and the lead-up thereof as Alex and the gang rally the remainder of his school to fight alongside them while Merlin hypnotizes the teachers and administration into giving Alex's newfound army any resources they might need. The creativity in this training montage is evident in such things as what the kids use for weapons and shields down to the traps they set for these lava-molded knights on horseback, but once the battle itself begins the sequence quickly devolves into a subpar CGI slugfest. If only Cornish leaned harder on the power of his film's character and his cast's charm the simple lessons he's trying to convey might have come through clearer.